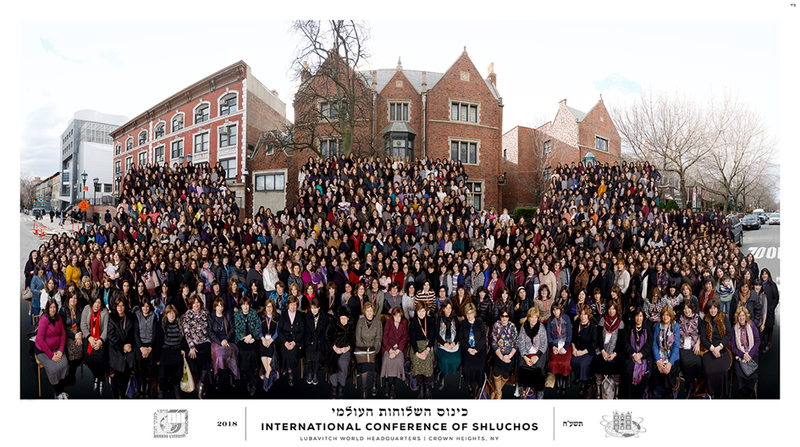 Women emissaries from around the world gathered for a group photo at the 26th annual Kinus Hashluchos, the International Conference of Chabad-Lubavitch Women Emissaries in Brooklyn, N.Y.
She opens her mouth with wisdom; the law of kindness is on her tongue. Later, the "revolutionary" idea of formal schooling for girls was cautiously and gingerly introduced into Torah society in the 1930s, not without some opposition. In Lubavitch, however, the concept was enthusiastically welcomed and supported by the Previous Rebbe. Then, in 1941, the Rebbe arrived in the United States, at which point the "Central Organization for Jewish Education" (Merkos L'Inyonei Chinuch) came into being. The Rebbe was appointed its head by his father in law (the Previous Rebbe) and one of the first institutions to be established by Merkos was the Beth Rivkah Girls' School. As the challenges and demands of the world beyond the home grew, Chabad Lubavitch responded by making formal, intensive Torah education for women an integral part of Jewish life. Today, eloquent testimony to the Rebbe's outlook on women's education is provided by the extensive network of Beth Rivkah and Beth Chana Girls' schools that span the globe from Melbourne, Australia, to the huge campus in Kfar Chabad II in Israel. The level of scholarship in these institutions is unmatched, both in scope as well as depth. Beginning from the earliest ages, through the High School and Seminary level, the schools provide a quality education that equips their graduates with the ability to meet any challenge. For the woman whose Jewish involvement came later in life, Chabad pioneered the concept that Torah knowledge must be an accessible necessity, not an unreachable luxury. Machon Chana in Brooklyn, New York, Beth Chana in Minneapolis, Minnesota, Machon Alta in Safed, Israel, and Ohel Chana in Australia are notable examples of institutions that have provided an intense intellectual experience to thousands of women, who had little or no Jewish education. Such is the picture in women's education. And what of communal activism? Shortly after ascending to the leadership of Lubavitch, the Rebbe founded Lubavitch Women's Organization ("Agudas N'Shei Chabad"), which was and remains unique. It was the first major women's organization which did not emphasize the objectives of fund raising and auxiliary activities, but education. Education of self and of others. For oneself continuing intellectual and emotional growth through Torah study, particularly chassidic teachings which provide the philosophical background for the way of life and pride of the Jewish woman, explaining the uniqueness of her role as foundation of the home ("akeret habayit"); and the unique powers granted her. For others: Dynamic outreach programs, bringing the depth of Torah and the beauty of mitzvot to the attention of the less informed, particularly to other women and girls, as exemplified by Lubavitch Women's leadership of the world wide Lubavitch campaigns for "Family Purity;" Shabbat candle lighting, kosher, etc. Today, Lubavitch Women's seminars and learning programs, speakers bureaus and resource centers are just a few of its activities. In hundreds of communities around the globe Lubavitch Women's sponsors the "Week of the Jewish Woman." 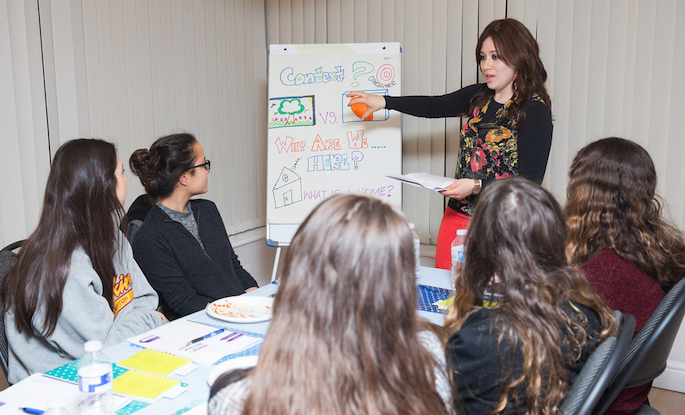 Annually in Europe and Israel, and biannually in America, thousands of women from all walks of life come together at Lubavitch Women's conventions to teach and to learn, to inspire and to be inspired, setting the agenda for the year ahead; and the girls' division, called B'nos Chabad, parallels all these activities on a younger age level. The ingredients: An intense Torah education to the highest levels. Involvement in communal activism and in outreach endeavors from the earliest years. A co-equal sense of mission constantly re-emphasized by the Rebbe, by teachers and parents. The result: Women who are uniquely capable of formulating and implementing the programs that can satisfy the challenges and respond to the questions of the times. Thousands of talented women, alongside their husbands, have become emissaries (shluchot) to various communities. The first challenge these couples face is to transplant the familiar chassidic environment in an atmosphere of foreign and opposing values; to create the warmth and strength of a chassidic home without the support of a nurturing community, far from family and friends. Quite often the challenge includes the need to learn a new language, to cope with incredible difficulty in obtaining kosher food, and to adjust to a new and strange style of day to day living. Many shluchot are admired for the grace and aplomb with which they rise to these challenges. The generous hospitality which characterizes Lubavitcher homes throughout the world is an expression of the warmth and wisdom of these women. The shlucha has the multifaceted role of mother and teacher of her own children, and "mother"/teacher to hundreds of others; a role model to her family and an inspiration to the community as a whole. Typically, she works tirelessly from early morning directing a school or teaching a class, counseling a parent or planning a program to the wee hours of the night, in addition to her obligations at home. (Many of the Lubavitch day schools and summer camps are administered, directed and managed entirely by women.) The shlucha embodies the very opposite of the stereotypical notion that leadership must be expressed through public posturing and exposure; she restores the classic Jewish model of leadership through the quiet, unassuming feminine approach of moral authority, influence and personal example. 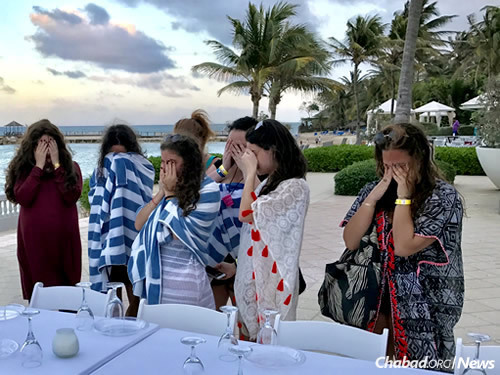 Every activity and institution of Chabad-Lubavitch world-wide is the accomplishment of a team of emissaries, comprised of both husband and wife. A Letter from the Rebbe: Being a "lamplighter" of Jewish souls is even more emphatically relevant to the Jewish woman, for she is the actual candle lighter, who was given the special divine assignment, extraordinary privilege, and bright mitzvah of lighting the candles for the holy Shabbat and festivals; and in a deeper spiritual sense ...in her role as "foundation of the home it is her privilege to light up the Jewish home and everyone in it including her husband and children, and the friends and visitors who come into the home; and in her role as mother, she is the first to light up the young little souls of the infants, until they begin to shine on their own. Thus she has a very important share in making her house and the House of Israel as a whole a fitting home for G d's Presence, in accordance with G d's design and desire — "that I may dwell among (and within) them." For more about the Jewish/chassidic view on femininity, visit our woman's site — JewishWoman.org.